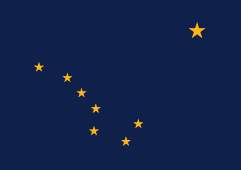 The Flag of Alaska has eight gold stars on dark blue. These stars form the Big Dipper and the North Star. The flag was created in 1927 by Benny Benson, a 13-year-old Alaska native. Up to that time, Alaskans had flown only the U.S. flag. Benson's design was chosen over 700 other submissions from school-children in grades 7–12. Most other entries showed the seal, the midnight sun, the northern lights, polar bears, and gold pans. To celebrate his achievement, Benson was awarded $1,000 and an engraved watch. The Alaska Legislature adopted the flag on May 2, 1927. It was kept as the state flag upon statehood in 1959. This song was made for the flag. This page was last changed on 4 January 2018, at 03:59.